WASHINGTON -- President-elect Donald Trump has announced that he will nominate attorney David Friedman as U.S. ambassador to Israel, selecting an envoy who supports Israeli settlements and other changes to U.S. policies in the region. Friedman said he looked forward to carrying out his duties from “the U.S. embassy in Israel’s eternal capital, Jerusalem,” even though the embassy is in Tel Aviv. Like some of his predecessors, Mr. Trump has vowed to move the American embassy to Jerusalem, a politically charged act that would anger Palestinians who want east Jerusalem as part of their sovereign territory. The move would also distance the U.S. from most of the international community, including its closest allies in Western Europe and the Arab world. The president-elect said Friedman would “maintain the special relationship” between the U.S. and Israel. Jeremy Ben-Ami, the president of liberal Jewish group J Street, called Friedman’s nomination “reckless,” citing his support for settlements and his questioning of a two-state solution with the Palestinians. The first Palestinian reaction came from Sheikh Ekrema Sabri, imam of the al-Aqsa Mosque in Jerusalem -- one of the holiest sites in the world to Sunni Muslims. He said in an interview with the London-based pan-Arab newspaper al-Quds al-Arabi on Friday that moving the U.S. embassy to Jerusalem would constitute a declaration of war. There was no immediate reaction from the Palestinian Authority. The statement from Mr. Trump’s team doesn’t detail how Friedman could work in Jerusalem. However, Trump advisers have insisted in recent days that the president-elect will follow through on his call for moving the embassy. 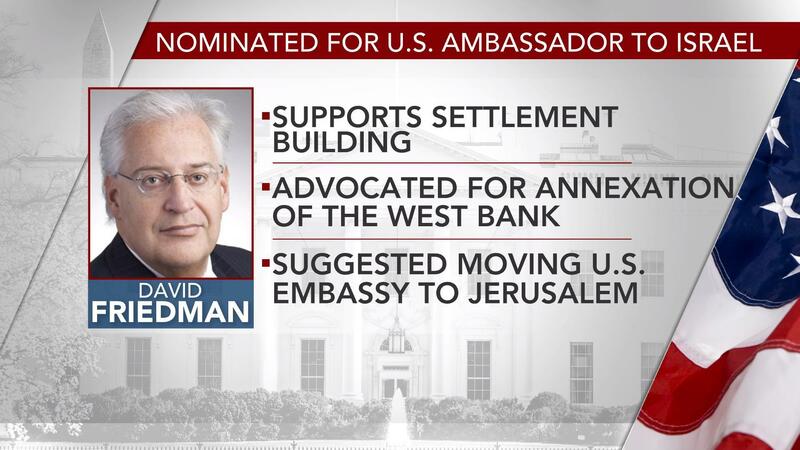 One option Trump allies have discussed would involve Friedman, if confirmed by the Senate, working out of an existing U.S. consulate in Jerusalem. According to a person who has discussed the plan with Trump advisers, the administration would essentially deem the facility the American embassy by virtue of the ambassador working there. It’s unclear how far those discussions have gotten or whether Mr. Trump himself has been briefed on the proposal. Mr. Trump’s transition team did not respond to questions about the matter. Both Bill Clinton and George W. Bush promised to move the U.S. embassy to Jerusalem, but backed away from the idea once in office. Israel captured east Jerusalem in the 1967 Mideast war and annexed it in a move that is still not internationally recognized. It claims the entire city as its capital. The Palestinians seek east Jerusalem, home to key Jewish, Muslim and Christian holy sites, as the capital of their future state. Virtually all embassies to Israel are located in or around Tel Aviv. Jerusalem Mayor Nir Barkat told The Associated Press this week that he has been in touch with Mr. Trump’s staff about the embassy issue. Barkat said his conversations have led him to believe that Mr. Trump is serious about making the move. Meanwhile, Israel’s West Bank settlers lauded Mr. Trump’s selection of Friedman, citing his support for the contentious housing developments in Palestinian territories. Oded Revivi, chief foreign envoy of the Yesha Council, said Friday that Friedman has a “deep love for all of the land and people of Israel, including those in Judea and Samaria” - using the West Bank’s biblical names. Friedman, an Orthodox Jew from Long Island, has long ties to Israel’s settler movement and has supported positions on the far-fight of Israel’s political spectrum.